Night version of today's outfit, just added the pointed toes, strong sholders on my simple turtelneck an that's it, I'm ready to PARTYY!! love the shoulder detail! also you are such a cutie! great outfit. grungy, rocker, chic. awesome. Very cool. Love this concept of day vs night! The addition of the structured shoulder jacket, the heels and the headband really transform this perfectly!! I love it! rock and chic at the same time! nice outfit! thos shoes are great! love the outfit you look great! You look fabulous! I love your headband and those jeans are super cute! 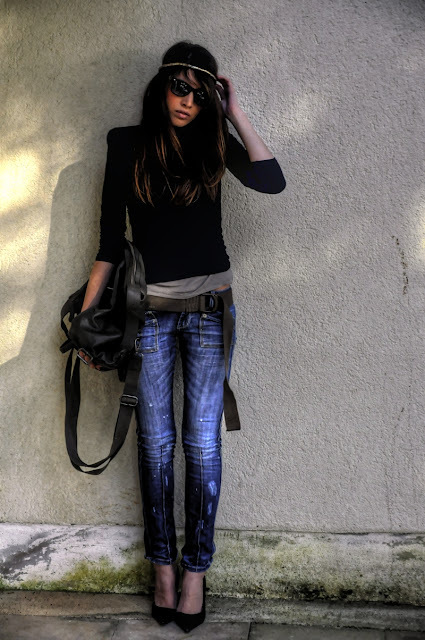 this outfit is wonderful, it's simple but incredibly chic... and those jeans look amazing on you! 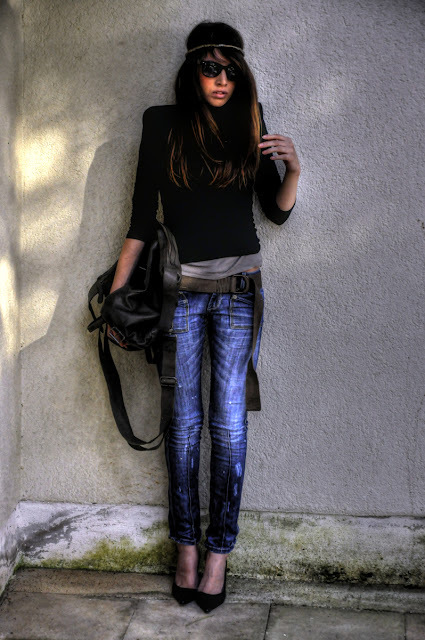 Love you jeans and square shoulders- chic! OMG! I love your outfit babe. Good job! Your jeans are smokin - love the outfit. WOW. I love your jeans, you feel very well. I also like how it gives you the headband, and I love the bag. I'll wait for you on my blog! wow, this look is amazing! Nice outfit! Thanks for your comment girl!! you are tooooooo gorgeous!!!! and your long skinny legs!! you wear a pair of jeans like no other! killing it in this outfit!! tooooo good.... and thanks for your comment love!! glad you liked my outfit! the first picture is rad! i can't tell if it's a reflection in your sunglasses or something cool on the lenses. but it certainly looks rad either way! still a big fan of headbands too. Love this look, very chic!